The first anniversary of Rana Plaza, the greatest catastrophe that faced any factory worker in the history of mankind, has just passed. After on e year, we look back when the Multi-Billion dollar international fashion industry came face to face with the hellish sight of its devastated workers. Rana Plaza was the biggest factory disaster that ever hit Bangladesh, but in no way was it the first. According to some reports, since 2005 there have been a total of 1728 deaths within Bangladeshi textile factories which work for brands that fill western high streets. This figure reflects the catastrophes since Spectrum through Tazreen till Rana Plaza. Since these tragedies, improvements have been promised by the BGMEA, government and buyers. New building codes, better inspection facilities, new amendments to the labor law, a new minimum wage, compensation promises, and an accord from Europe came along with an alliance from USA to save our battered blue collared souls. Before going to look over the labor safety in RMG and sustainability of the sector in the long run, let us have a brief overview of this sector of Bangladesh. As a result, in 2011 Bangladesh accounted for 4.8 per cent of global apparel exports, compared with only 0.6 per cent in 1990. Over the same period, total exports as a share of GDP increased from around 5 per cent in 1990 to over 23 per cent in 2011. Even during the financial and economic crisis, exports remained rather resilient. This was mainly due to the fact that consumers in the advanced economies substituted towards lower-priced apparel goods. During the last three decades this sector has achieved a phenomenal growth, due to policy support from the government and more importantly dynamism of the private sector entrepreneurs along with extremely hardworking but civic workers. Now the number of RMG units is around 5,000 and the export earnings have exceeded USD 19 billion with 145 countries using `made in Bangladesh’ knit garments and 126 countries using Bangladesh woven products. Analysts are telling-the apparel export numbers can be more than doubled by 2020. The growth in the last two decades has created jobs, but with harsh working conditions and low pay, including in export-related industries. Indeed, recent events in Bangladesh have brought the issue of occupational health and safety risks in the Bangladeshi garment sector to world attention. In response to a surge in the demand for ready-made garments from foreign companies, suppliers in Bangladesh have established factories and manufacturing sites without following building and safety codes and the Government of Bangladesh has not provided adequate regulatory oversight and enforcement. This prospective sector is yet swarmed by some serious problems that may threaten its stability in the long run. Bangladeshi workers earn some of the lowest wages in the world. For example, as of August 2013, the monthly minimum wage for entry-level workers in Bangladesh’s garment sector was US$ 39 per month – about half of the lowest applicable rate in other major garment-exporting countries, such as Cambodia (US$80), India (US$71), Pakistan (US$79), Sri Lanka (US$73) and Viet Nam (US$78). And while other countries revise their minimum wages on an annual basis, Bangladesh has adjusted the RMG minimum wage only four times since it was first set in 1985 (with the last revision dating back to 2013). Currently the wage rate was fixed to be 5300 taka per month for garment industries. However, there are still people working outside garment industries in Bangladesh who don’t fall below this category. 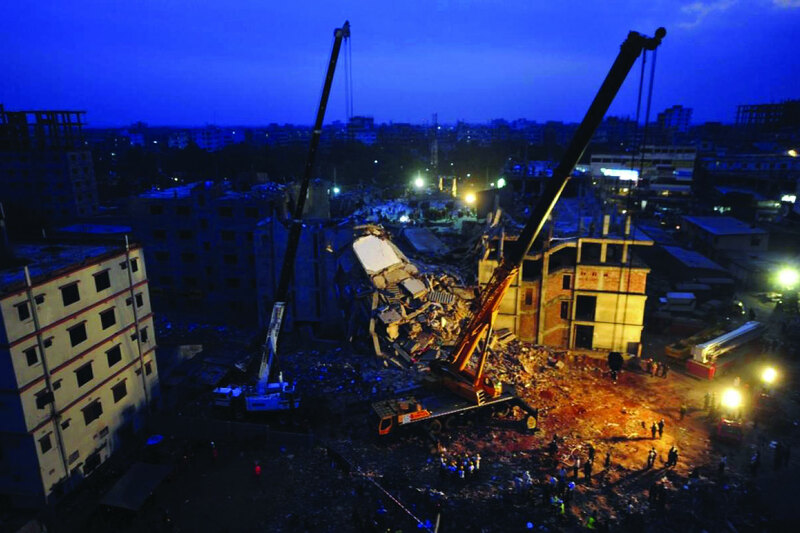 On April 11, 2005, the nine-storey building of Spectrum Sweater Industries at Baipail in Palashbari under Savar upazila collapsed because of its weak foundation, leaving 64 workers dead and many more remaining missing to date. A five-storey building housing Phoenix Garments in Tejgaon collapsed on February 25, 2006, leaving at least 25 workers dead. Other major tragedies include death of eight workers in a fire at Smart Export Garments in the capital, at least 111 workers in a fire at Tazreen Fashions, 51 workers in fire at Garib and Garib, Matrix Sweater and Ha-Meem Group in 2010, 65 workers in a fire at Chitagong KTS Composite Textile Mills in 2006, 20 workers in a fire at Narayanganj Sun Knitting in 2005, and 48 workers in a fire at a Narsingdi garment factory in 2004. Working conditions in the RMG sector frequently violate international standards, and Codes of Conduct. Work areas are often overcrowded with limited workspaces, causing occupational hazards and contagious diseases. Injuries, fatalities, disablement and death from fire and building collapses are frequent in the RMG sector. The absence of standards monitoring system and ineffective building codes, poor enforcement and outdated laws, and a lack of awareness of rights among workers. Recruitment policies are highly informal compared to western standards and there are no written formal contracts and appointment letters. They are therefore vulnerable to losing their jobs at anytime. However, fear of losing their jobs and lack of alternative job opportunities compel workers to continue in unsatisfactory employment focuses; Garments workers are concerned with long working hours or double consecutive shifts, personally unsafe work environment, poor working conditions, wage and gender discrimination. Indeed, employers treat the RMG workers as slaves, exploiting workers to increase their profit margins and keep their industry competitive in the face of increasing international competition. l At least one alternative exit with a stair connecting all the floors of the factory building. l No exit can be locked or fastened during working hours. l An effective and clearly audible means to warn of fires. l Cleared passages providing access to each escape route. l A fire drill at least once a year in each factory where more than fifty workers are employed. But it seems most of the factories simply don’t bother at those bindings and they frequently decline the compliance with these regulations that could have saved lives of millions of RMG workers in past years. As the demand for cheap clothing grows in the west, brands continue to look for ways to race to the bottom on prices, and sadly this involves cutting corners on health and safety. Brands will by no means admit to this. There were more than a dozen of brands buying from Rana Plaza and yet only one of them PRIMARK, has pledged for compensation. Moreover, international buyers are divided over how to ensure workers’ safety in garments, between ACCORD and ALLIANCE. Some of them have promised to compensate while some others are not willing to compensate financially. RMG is a big concern for our country that involves stakes of government, owners as well as foreign buyers. GoB should effectively enforce the labor law and amend it to comply with international standards and ensure workers’ rights to form unions and increase factory inspections. Moreover it should investigate allegations against factory owners who engage in anti-union activity and all allegations of beatings, threats, and abuse by workers and prosecute those responsible. BGMEA should Support the establishment of independent trade unions in members’ factories and discourage the setting up of so-called “yellow unions.” This agency needs to Work with the government to ensure that anti-union behavior is eradicated and work with the International Labour Organization to educate factory owners in the benefits of having independent trade unions and improved labor relations.